BU’s oldest dance team, Fusion has a well-earned reputation in the collegiate dance world for creativity and originality. The group has been performing its unique brand of hip-hop, incorporating elements of contemporary dance, jazz-funk, and other street dance styles, since it was founded in 1993. The troupe, with 36 members currently, prides itself on its diversity. The dancers bring different experience levels and dance styles to the team, which holds auditions each fall and spring. “I did a form of Chinese folk dancing in high school,” says Jonathan Ko (CGS’17, ENG’19), “but I knew that I wanted to join a hip-hop dance team in college.” Four years later, he’s not only dancing with the troupe, but is codirecting along with Gianna Iafrate (ENG’19). The dancers rehearse three times a week, for up to three hours at a time, but when a competition is in the offing, rehearsals are held daily. Fusion dancers not only train and perform a highly diverse repertoire, but are part of a group that fosters a sense of community, both among its members and within the larger collegiate dance community. 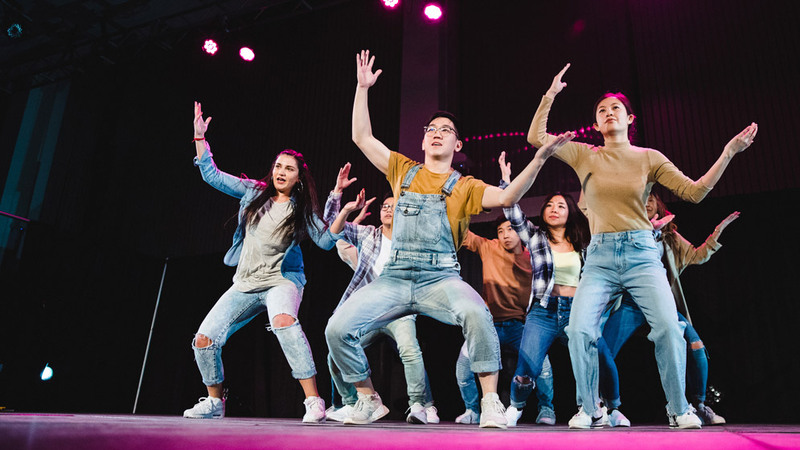 Fusion will host ELEMENTS XIX, its annual dance competition, on Saturday, March 30, 2019, at the George Sherman Union. One of only a few premier collegiate dance competitions on the East Coast, it will feature more than 400 competitive dancers and is expected to draw more than 1,000 fans. Master classes from world-renowned choreographers will be held after the competition. “A lot of people go to ELEMENTS, people who have never danced before, and have the inspiration to dance,” Ko says. Fusion will showcase its latest choreography at Fusion Presents: Elements XIX on Saturday, March 30, 2019, in the George Sherman Union Metcalf Ballroom, at 7 pm. Purchase tickets, $14 for BU students, $22 for non-BU students purchasing online, and $25 at the door, here. Aaron Hwang (ENG’21) can be reached at aahwang@bu.edu.